The 3-D printing is a process that uses computer to create a three-dimensional object, often a complex or multi-layered object. In a room painted yellow and white, a square machine is buzzing — its needle busy printing a blue triangular object. In one corner lies a broom with electric wires all over it, in another corner a table is full of fibre models built out of 3-D printing. In this maker’s space in Ballard Estate near CST station, age being no limit, people are encouraged to walk in and just innovate through 3-D printing and doodling. The 3-D printing is a process that uses computer to create a three-dimensional object, often a complex or multi-layered object. The technology is finding its way into medicine with doctors often using 3-D printed models of organs to practise a surgery, and in architecture for modelling buildings. The idea to encourage common folk, not just professionals, to experiment with 3-D doodling struck founder Girish Nair about three years ago as he sat observing his children, now aged 14 and 18 years. “The knowledge children get in school is all bookish. I wanted to create a space where they can innovate and build things themselves, so that they can actually experiment with what they learn,” he says. Having worked in Silicon Valley for 15 years, Nair moved to Mumbai for a start-up. “We have installed 3-D printers. In every workshop we teach participants how to design on software and print an object. We encourage them to imagine,” he adds. The weekly Saturday sessions see a crowd of over 15 people, sometimes couples, sometimes grandparents bringing in little ones and mostly parents joining in with their children. In two hours that follow, they are taught basics of Autodesk software that is used for 3-D printing and given a free hand to design and create their own model. A simple 3-D plastic model may take an hour or so to get printed. Recently, a Coimbatore-based neurosurgeon attended a 3-D doodling session. Later, he bought one for himself to help patients understand the neurological condition through 3-D objects he would create with the pen. Meera Surve (50), a teacher, loves doodling on paper. “I never envisaged what 3-D doodling could do. In my first workshop, I made a pair of glasses and a face mask. I was so fascinated I bought a 3-D pen for myself,” she says. When Surve visited Germany, she realised 3-D printing was more common there. Her German friend, who owned a machine, made her a comb, a bookcase and jar covers. “It is amazing the wonders you could do with 3-D doodling. I have only learnt to make a heart out of doodling for greeting cards,” she says. “But I hope to do much more.” The idea for this maker’s space, called Curiosity Gym, is to combine engineering, mathematics with arts and innovation. Kapil Agarwal (36), an electronics engineer who is now a mentor at Curiosity Gym, says he is finding new ways to teach children through digital learning. “We have expanded this concept in 10 schools in Mumbai. Some are extremely passionate and we realise we can make learning fun for them,” he says. 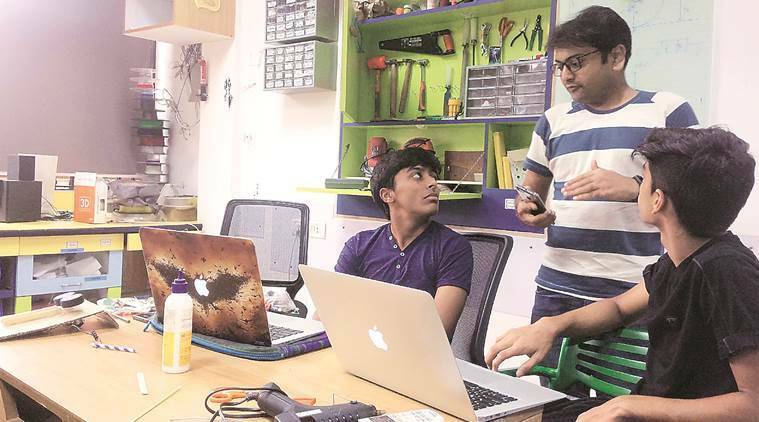 Teens Yashwardhan Kothari and Dhruv Zaveri have been coming for these workshops since four months to create a board game for visually challenged people. “My brother is visually impaired. He often complains how he can’t play a board game. This game we are creating is for such people,” Zaveri says. The game, a knowledge test, will use some bit of 3-D printing and some electronics. The two keep getting guidance from mentors at the workshop. While the attraction of this space is 3-D printing, people are also encouraged to do wood work, fuse wires and create anything they imagine. A broom with several wires in one far corner, as founder Nair points out, is the work of XI grade student Shlok Shah. “As the user sweeps, the kinetic energy produced is used to charge a portable battery. This can be used to charge mobile phones,” Nair says. In another part, a sand pit holds a simulator. “We will make children wear virtual reality glasses and operate the simulator. This is to give them a feel of operating a vehicle on Mars,” says Anuj Shah, another mentor. He adds that the concept of a maker’s space is new to Mumbai but is picking up interest. “It encourages learning in a fun way beyond school curriculum, and that is why I decided to join the space,” he says.